He is the best example for being a sishya since when emperumAnAr was upset with him once, AzhwAn said that "since I am completely subservient to emperumAnAr I have nothing else to do than accepting what he does". He showed how a sishya should be totally surrendered to his AchArya. Let us see why kUrathAzhwAn is glorified by many pUrvAchAryas in their works. 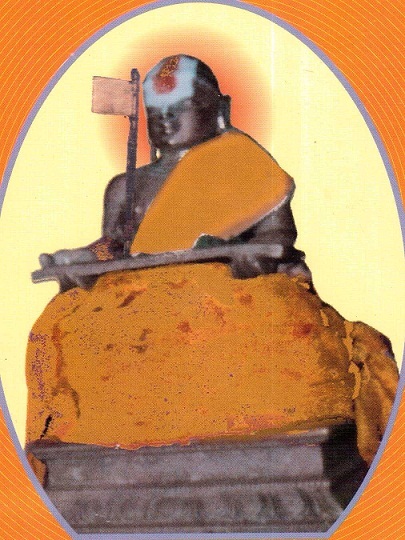 piLLai lOkAchAryar in his srIvachana bhUshaNa dhivya sAsthram identifies the main focus of sishyan and AchAryan in 328th sUthram. chishyan ugappilE UnRippOrum; AchAryan ujjIvanaththilE UnRippOrum. சிஷ்யன் உகப்பிலே ஊன்றிப்போரும்; ஆசார்யன் உஜ்ஜீவனத்திலே ஊன்றிப்போரும். sishyan's focus should be on AchAryan's pleasure; AchAryan's focus should be sishyan's upliftment. Since a sishyan is fully dependent on his AchAryan, he should focus on his master's pleasure. Since An AchAryan is most merciful, looking at the pitiful state of the sishyan in samsAram, he should focus on uplifting the sishyan from samsAram. A sishyan should thus become the target of AchAryan's happiness and not his anger. Even if the sishyan becomes a target of AchAryan's anger, since it is for the well-being of the sishyan, it is acceptable from both AchAryan and sishyan's perspective. A sishyan should not analyse the reason for the anger (to find fault in AchAryan). AchAryan's anger is like bhagavAn's anger. bhagavAn also at times shows his anger to reform the jIvAthmA and that act is part of the final goal (to be fully purified). Similarly, AchAryan's anger should also be accepted the same way. If we go through the life of AzhwAn, it is very clear that he is the epitome of both sishyathva and AchAryathva pUrthi. When emperumAnAr was summonned to the saiva king's court and his life was under threat, AzhwAn took up the responsibility to protect his AchAryan even at the cost of his own life. He stood firm for the supremacy of srIman nArAyaNan and in the process lost his eyes as well. 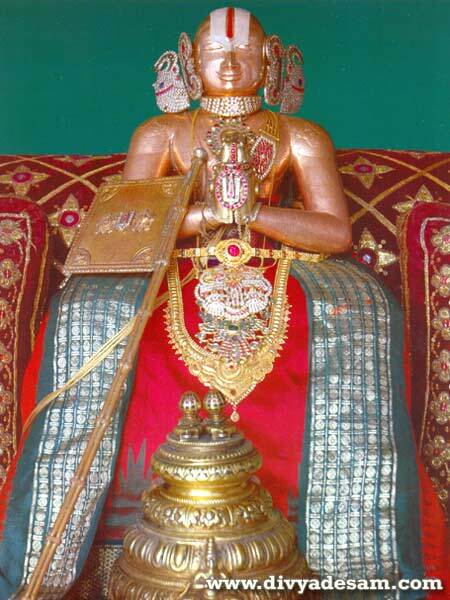 He gives his own dharisanam (vision) for emperumAnAr's dharisanam (sampradhAyam). He never worried for his loss even for a moment, and even when emperumAnAr insists him to pray for his vision from dhEva perumAL, AzhwAn simply asks that he has the constant vision of dhEva perumAL and emperumAnAr only. As we have seen already, when emperumAnAr was upset with AzhwAn, AzhwAn simply accepted that and explained that he is subservient to emperumAnAr and emperumAnAr can do whatever he wants with him. Another striking example of his sishyathva pUrthi is the ekOthishtam incident of thiruvarangathu amudhanAr's mother. amudhanAr was the incharge of srIrangam temple and he was being a major hurdle for emperumAnAr in reforming the temple activities. emperumAnAr slowly engages AzhwAn in teaching real knowledge to amudhanAr. amudhanAr thus becomes purified and becomes very attached to AzhwAn and emperumAnAr. When his mother passes away, on the 11th day, a ceremony named EkOthishtam is to be performed where a person is assumed to be the body of the deceased person and offered a great feast. At the end of the feast, the consumer of the feast will be asked if he is satisfied and unless he says he is fully satisfied, the ceremony does not become complete. The main aspect of this ceremony is, the one consuming the feast cannot participate in any temple kainkaryam for 1 full year those days. amudhanAr wanting to have an advanced srIvaishNava approaches emperumAnAr and asks him to identify such person. emperumAnAr at once asks AzhwAn to go to that ceremony and AzhwAn happily accepts. Once the feast is over, amudhanAr asks AzhwAn if he was satisfied and AzhwAn says he will be satisfied only it the temple control is handed over to emperumAnAr. amudhanAr at once agrees and hands the temple keys and control to emperumAnAr through AzhwAn to fulfill his commitment. From this, we can understand the utter dependence of AzhwAn on his AchAryan. Being a great personality, he need not give up his kainkaryams for one year. But purely for the pleasure of his AchAryan (which is to reform the temple and ensure proper functioning of the same), he took up the most difficult challenge and fulfilled it without any tinge of hesitation in his mind. nAlUrAn's scenario where even though nAlUrAn (unknowingly) caused the loss of his eyes and the separation from emperumAnAr, AzhwAn did not have even a tinge of anger on him. On the other hand, he had great attachment towards nAlUrAn (who unknowingly committed a mistake) and ensured that bhagavAn gives paramapurushArththa mOksham to him also. 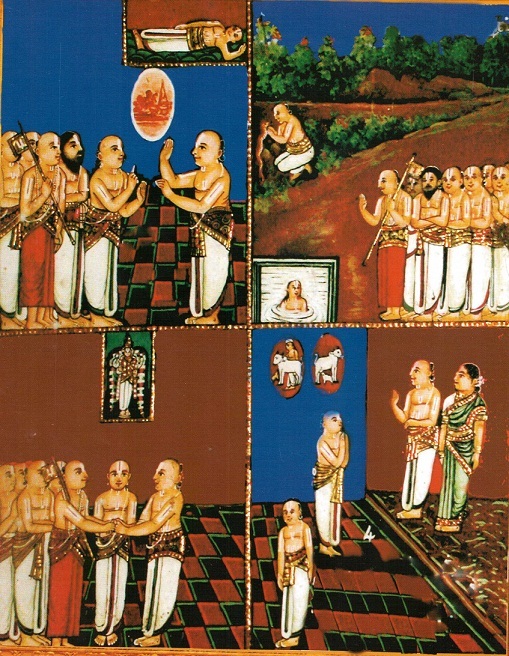 When piLLai piLLai AzhwAn (AzhwAn's sishya) was continuously committing bhAgavatha apachArams, he goes to him during uththarAyaNa puNya kAlam and asks him to give all his sins as dhAnam to him thereby AzhwAn voluntarily takes up the sins of his sishyan's activities and reforms him through his own exemplified conduct. The above 2 principles can be easily understood by looking at thiruppAvai 3rd pAsuram - Ongi ulagaLantha uththaman (the top-most person who measured the 3 worlds). Here, uththaman is beautifully explained by azhagiya maNavALa perumAL nAyanAr in his 6000padi vyAkyAnam. He explains four categories of people and brings out the glories of emperumAn who goes and begs for 3 feet of land from mahAbali for the sake of indhran. As we have seen, above, AzhwAn even though being AchArya, many times takes up so much trouble for himself to uplift others. This quality cannot be seen in any normal person. Any one can appreciate the great qualities of AzhwAn for his most merciful nature. And this is why he is rightly glorified as an amsam of srIrAman, because, srIrAman always looked out for others' welfare even at the cost of his own suffering. And fittingly, AzhwAn's thiruvArAdhana perumAL is srIrAma parivAr as well. We can see sIthA samEtha rAmA, lakshmaNa, hanuman along with kUrathAzhwAn in EkAsanam on punarpUsam day of his varushOthsavam at his avathAra sthalam. This is why amudhanAr hailed AzhwAn in rAmAnusa nURRanthAdhi as "mozhiyaik kadakkum perum pugazhAn" (மொழியைக் கடக்கும் பெரும் புகழான் ) which means AzhwAn's glories are beyond the limits of words/language. This same principle is explained by maNavALa mAmunigaL as "vAchAm agOchara mahA guNa dhEchikAgrya kUrAthiNAtha" (வாசாம் அகோசர மஹா குந தேசிகாக்ர்ய கூராதிநாத). 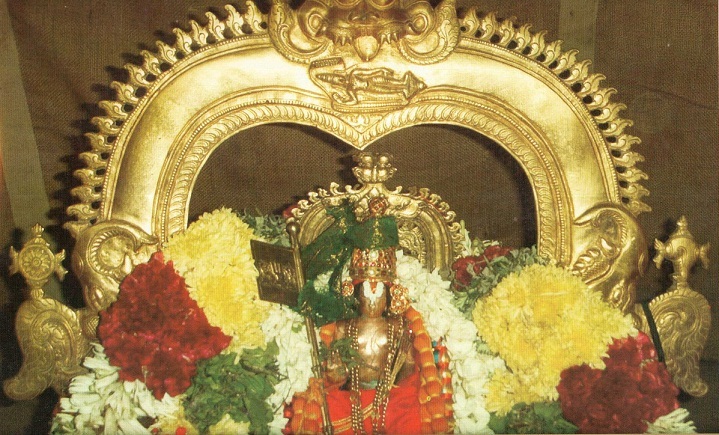 Fittingly his glories are revealed through the arvAnchO slOkam which is recited even today as part of the thirumanjana kattiyam in kUram (AzhwAn's avathAra sthalam). How can we speak the greatness of kUrthazhwan within the boundary of words? Everyone gets mOksham through srI rAmAnuja - some (who are elder to srI rAmAnuja) through his thirumudi sambhandham and others (who are younger to srI rAmAnuja) get mOksham through his thiruvadi sambhandam (Full explanation can be seen in http://ponnadi.blogspot.in/p/charamopaya-nirnayam.html). Such great personality srI rAmAnuja himself proclaims that it was due to his sambhandham to kUrathAzhwAn, he gets mOksham. We have only seen a glimpse of his glories and they are unlimited. There are many more incidents in his life which brings out his greatness, compassion and dedication towards his AchArya. Let us meditate on AzhwAn's divine lotus feet and pray for devotion towards the same. Simply being the target of AzhwAn's katAksham (vision) and krupai (mercy) will purify us and nurture the proper srIvaishNava lakshaNam (http://ponnadi.blogspot.in/p/srivaishnava-lakshanam.html) in us. 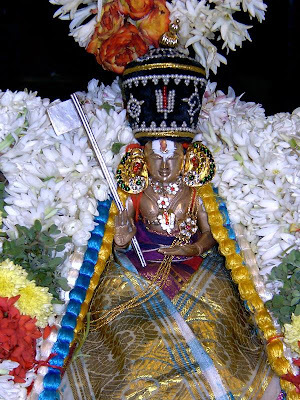 thirumazhisai AzhwAr is popularly known as bhakthi sArar. AzhwAr was honoured with this title/name by none other than rudhran after understanding AzhwAr's full potential. As narrated in guru paramparA prabhAvam, when rudhran was travelling along with his wife pArvathi on his rishabam on the sky, he notices AzhwAr dressed in some ragged clothes and stitching something. rudhran glorifies AzhwAr to pArvathi as a great vishNu bhakthar and she wants them to go and give him some benediction. They go down and ask him what he wants. AzhwAr rejects their offer and tells them they cannot offer what he wants (that is mOksham). An argument rages and that leads to rudhran opening his third eye and starts sending agni (fire). AzhwAr opens his third eye (in his toe) and rudhran is unable to bear the heat from that agni. Finally srIman nArAyaNan intervenes and rescues rudhran. 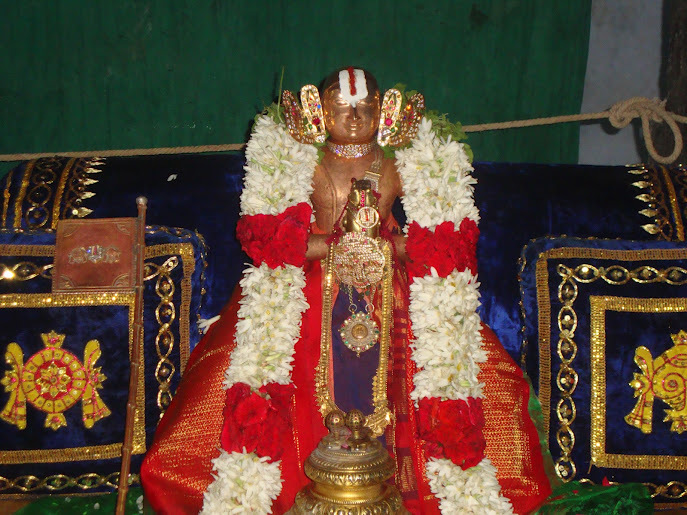 rudhran, at that time, admiring AzhwAr's unflinching faith on srIman nArAyaNan, honours him with the title "bhakthi sAra" (an embodiment of ultimate vishNu bhakthi). 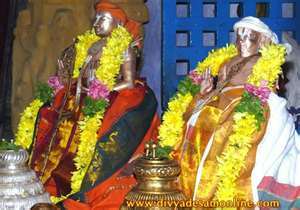 thathvams (true principle/entity) according to our sampradhAyam are three. They are chith, achith and Ishvaran. chith thathvam - sentient beings - all entities that have gyAnam (valid knowledge). Here the true svarUpam of chith thathvam is that they have the knowledge that they are fully dependent on srIman nArAyaNan. achith thathvam - insentient - all entities that lack gyAnam. This is divided in 24 entities - namely - mUla prakrithi, ahankAram, mahAn, manas, karmEndhriyam (5 organs of action), gyAnEndhriyams (5 organs of knowledge acquisition), pancha bhUthams (5 gross elements) and panch thanmAthrams (5 subtle elements). Ishvara thathvam - the supreme sentient being - srIman nArAyaNan who is the master of all sentient beings. He is known as bhagavAn - one who is complete in six qualities - gyAna (knowledge), bala (strength), ishvarya (wealth), vIrya (valour), shakthi (power), thEjas (radiance). These six qualities further expand in to innumerable divine qualities. He has beautiful forms (See parathvAdhi panchakam explanation at http://ponnadi.blogspot.in/2012/10/archavathara-anubhavam-parathvadhi.html), divine pastimes. He is the master of the two worlds - nithya vibhUthi (paramapadham - spiritual/eternal - permanent) and leelA vibhUthi (samsAram - material - temporary). 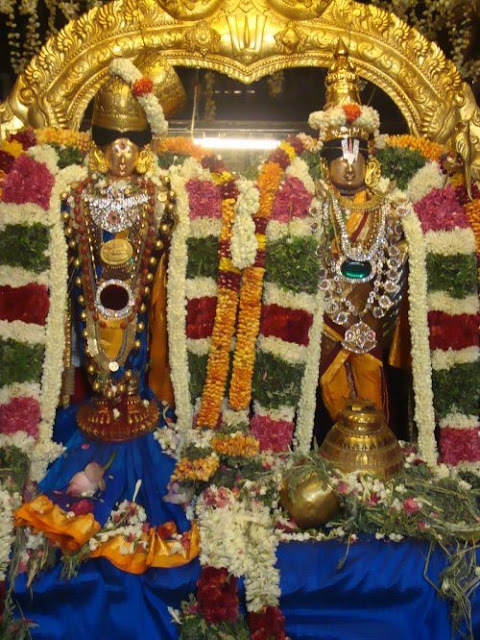 In paramapadham, He has many dhivya mahishis (consorts) headed by srI mahAlakshmi, bhUmAdhEvi, neeLA dhEvi. He has many divine servitors headed by ananthan (Adhi sEshan), garudan, vishwaksEnar, etc. In samsAram, He is served by innumerable brahmAs (one per aNdam - planetary system), rudhras, indhras, etc., who are mortal beings and are incharge of ensuring the proper functioning of samsAram. Of these 3 thathvams, our AzhwArs/pUrvAchAryas have established that Ishvara thathvam is the focal point. Both chith and achith exist for the pleasure of srIman nArAyaNan. So, Ishvara thathvam is called as thathva sAram. Also, when one understands Ishvara thathvam properly, other thathvams are easily understood as well, Ishvara thathvam (bhagavath vishayam) is called thathva sAram. essence of upanishadhs is nArAyaNa anuvAkam (nArAyaNa sUktham) which establishes clearly that parabrahmam, param jyOthi, etc., points to srIman nArAyaNan. essence of nArAyaNa anuvAkam is vishNu gAyathri which identifies the 3 important names of emperumAn which represents his sarva vyApakathvam (omni presence). essence of the vishNu gAyathri is the first name - nArAyaNa which clearly explains the chith, achith and Ishvara thathvams. It is also declared that this nArAyaNa nAmam/manthram is the essence of the whole vEdham. nArAyaNa manthram (thirumanthram) clearly instructs us the essence of whole sAsthram. piLLai lOkAchAryar in his mumukshuppadi, summarizes the whole meaning of thirumanthram in the final sUthram (115) of thirumanthra prakaraNam. Let us see that now. Aga, 'thirumaNthiraththAl emperumAnukkE uriyEnAna NAn enakku uriyan anRikkE ozhiya vEnNum; sarvasEshiyAna NArAyanNanukkE ellA adimaigaLum cheyyap peRuvEnAga vEnNum' enRathAyiRRu. ஆக, 'திருமந்திரத்தால் எம்பெருமானுக்கே உரியேனான நான் எனக்கு உரியன் அன்றிக்கே ஒழிய வேணும்; ஸர்வஸேஷியான நாராயணனுக்கே எல்லா அடிமைகளும் செய்யப் பெறுவேனாக வேணும்' என்றதாயிற்று. Thus, From thirumanthram, it is established that I (this jIvAthmA) who is owned by srIman nArAyaNan should exist purely for him (without any self interest/motivation); I should serve srIman nArAyaNan (who is the master of everyone/everything) in all possible ways. Looking at mAmunigaL's beautiful commentary, we can relate that this simple sUthram explains the essence of the whole of thirumanthram (that was previously explained in 114 sUthrams by piLLai lOkAchAryar). Now that we understand the 3 principles - bhakthi sArar, thAthva sAram and upadhEsa sAram, let us understand the link between these 3 now. 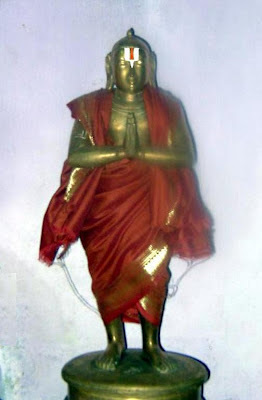 While mudhalAzhwArs focussed on establishing the supremacy of srIman nArAyaNan based on many pramANams from sAsthram, thirumazhisai AzhwAr focusses on establishing the exclusive supremacy of srIman nArAyaNan and instructs us the most important aspect of not being attached to any other dhEvathais (brahmA, rudhra, indhra, etc). Right in his first pAsuram of nAnmugan thiruvanthAdhi, AzhwAr establishes that nArAyaNan creates brahmA and brahmA creates rudhran. Thus, he says that he is revealing the essence of sAsthram and asks us to contemplate on it and act accordingly. srIman nArAyaNan denoted by "a"
of all jIvAthmAs denoted by "m"
The most important letter in praNavam is the one in the middle, that is "u" (ukAaram) which indicates the EXCLUSIVE nature of the subservience of jIvAthmAs towards srIman nArAyaNan. piLLai lOkAchAryar explains this beautifully in mumukshupadi - thirumanthra (1st) prakaraNam. 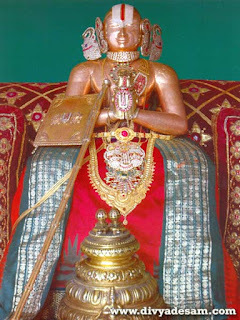 While explaining this, he quotes bhakthi sArar's (thirumazhisai AzhwAr) divine srIsUkthi to establish this principle in sUthram 64.
mAmunigaL beautifully explains that the main quality of srIvaishNavas is that they can even forget the names of their master at times, but will not go to any other dhEvathas even at that time. 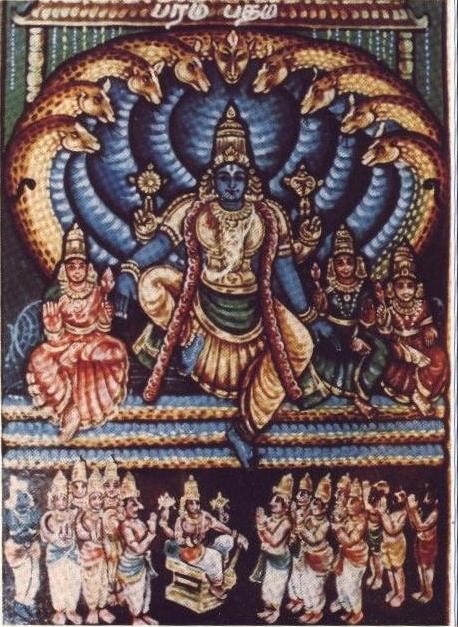 yama dharma rAjan calls his dhUthas (messengers) and informs to them secretly that "Dont forget my orders - when you see srIvaishNavas who will not worship anyone other than srIman nArAyaNan (and ones who are fixed on devotion to srIman nArAyaNan), worship them (since I am not the master for them)". periyavAchAn piLLai beautifully explains the deep meanings of this pAsuram. This pAsuram is identified as direct translation of srI vishNu purANa slOkam "svapurusham abhivIkshya..." which also shows the conversation between yama and his servants. We can even forget our master (srIman nArAyaNan) but cannot go to another dhEvathai. Avoiding dhEvathAnthara bhajanam (worshipping other dhEvathais) is shown as the most important aspect of being a prapanna (one who is surrendered to srIman nArAyaNan) - if we worship other dhEvathais we will no longer be prapannas. The above principle is explained using a beautiful/crisp example. A wife need not have full attachment towards her husband - it can develop slowly. But if she starts looking out for some other person - that will create a permanent damage in the relationship. The same way, even if we are not fully attached to emperumAn that is fine, but if we start going to other dhEvathais (this includes all dhEvathais, self styled gurus who dont follow our sampradhAyam, etc) - that itself will be a good reason by emperumAn (vishwapathi - husband of everyone) to discard/reject us. yama instructs his servants to give up their judgemental attitude and take up a serving/devotional attitude towards such srIvaishNavas since they are most worshippable. 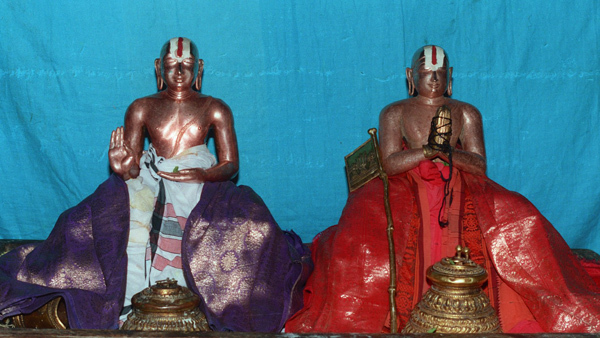 Of the nine sambandhams between paramAthmA and jIvAthmA, pathi - pathni relationship is one of the main relationships. Since a chaste wife (pathni) has nothing to do with other purushas, jIvAthmA has nothing to do with any one other than purushOththaman who is vishwapathi (husband of all jIvAthmAs). Once during a procession of srIranganAthan (srIrangam), rAmAnujar is leading the srIvaishnavas in the front. At that time, it starts raining suddenly, and for protection, srIranganAthan is carried into a nearby shiva temple. But rAmAnujar waits outside in soaking rain and does not enter the shiva temple - ofcourse other srIvaishnavas wait as well since rAmAnujar did not enter. When the priests of shiva temple invite rAmAnujar inside, he says he will not enter into other dhEvathais temples. The priests say "Oh! your lord himself entered, why dont you enter as well". rAmAnujar politely replies "My lord is the lord of universe and the owner of everything - so he can enter anywhere. But we are like his chaste wife. We will not enter any other place than my lord's own residence". Such should be our nishtai that even at dire situations we should not think about going to dhEvathAnthrams. nama: padham in thirumanthram is an expansion/explanation of this ukAram (u) of praNavam. While explaining nama: padham, piLLai lOkAchAryar brings out the essence of thirumanthram using thirumangai AzhwAr's srIsUkthi. "uRRathum un adiyArkkadimai" engiRapadiyE ithilE bhAgavatha sEshathvamum aNusaNdhEyam ("உற்றதும் உன் அடியார்க்கடிமை" என்கிறபடியே இதிலே பாகவத ஸேஷத்வமும் அநுஸந்தேயம்). 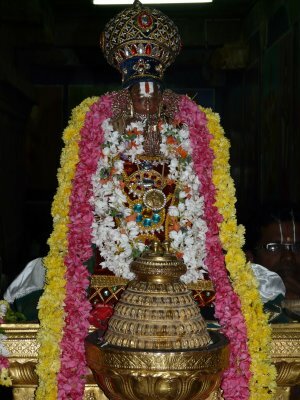 Since thirumangai AzhwAr says after learning thirumanthram, I understand that I am the servant of your (srIman nArAyaNan's) servants, nama: padham reflects bhAgavatha sEshathvam (being the servants of bhAgavathas). mAmunigaL highlights that once we have our ahankAram (dhEhAthma abhimAnam - thinking we are the body) and mamakAram (sva svAthanthriyam - thinking we are indpendent and we own everything) are removed, we will eventually be situated in the ultimate level of bhagavath sEshathvam (servitude towards bhagavAn) which is bhAgavatha sEshathvam (servitude towards bhAgavathas). Just like when a wife serves husband's parents, brothers, sisters, etc who are dear to the husband, the husband will be happier than her serving him (same can apply in husband serving wife's parents, etc), bhagavAn will be happier if we serve his dear bhakthas. through bhakthi sArar's (thirumazhisai AzhwAr) and AchAryas words. 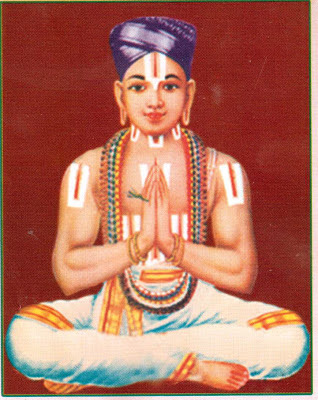 thiruppAvai is the essence of ubhaya vEdhAntham. When one understands the esoteric meanings of thiruppAvai properly, all the hurdles in their journey towards emperumAn is easily removed. virOdhi svarUpam (the hurdles which stop the individual soul from achieving the ultimate goal). His parathvam (supremacy) - that emperumAn is the AdhAram (resting place or foundation) and all jIvAthmAs are AdhEyam (that which rests on that foundation). His saulabhyam (easy accessibility - being present everywhere) - that emperumAn is the antharyAmi (inner soul) of all the jIvAthmAs. namakku is explaining the jIvAthma svarUpam - all jIvAthmAs depend on emperumAn. With the EvakAram (namakkE) ANdAL establishes the nature of the person who is ready to surrender to emperumAn, i.e., one who declares his Akinchanyam (that he has nothing to offer), ananya gathithvam (no other refuge) and is fully surrendered to emperumAn. nArAyaNanE tharuvAn is explaining the upAya svarUpam - nArAyaNanE tharuvAn means "Only nArAyaNan will give the ultimate benediction to jIvAthmAs". paRai is explaining the upEya svarUpam - paRai means kainkaryam to emperumAn without any tinge of expectations for ourselves. virOdhi svarUpam is implicitly explained as our sva svAthanthriyam (independence) that stops emperumAn from helping us. This is further explained by many pUrvAchAryas in their detailed vyAkyAnams. "thUya peruNIr yamunaiththuRaivan" (தூய பெருநீர் யமுனைத்துறைவன்) - One who lives on the banks of the pure yamunA river. 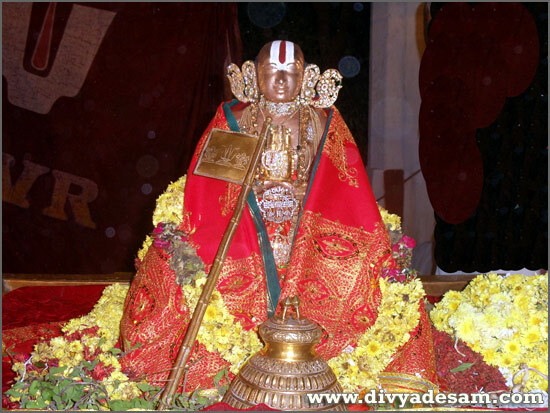 jIvAthma svarUpam is further explained in the 6th to 15th pAsurams. Here it is established that jIvAthmAs should always be looking for the association of SrIvaishNavas and always approach emperumAn through them. Further in 16th and 17th pAsurams, it is explained that jIvAthmAs should glorify nithyasUris who are very dear to emperumAn. In 18th to 20th pAsurams, it is established that jIvAthmAs should go to emperumAn with the purushakAram of pirAtti (nappinnai nAchiyAr who is the incarnation of nILA dhEvi and is the most dear wife of krishNan in vrindhAvan). virOdhi svarUpam is further explained in the 2nd pAsuram mainly as neyyuNNOm, pAluNNOm meaning we wont accept anything other than emperumAn as enjoyable objects while we are in pursuit of bhagavAn. ANdAL also says "cheyyAthana cheyyOm" (செய்யாதன செய்யோம்) meaning we should not do/perform whatever that is not done/performed by our pUrvAchAryas. ANdAL establishes emperumAn is the sidhdha sAdhanam (established upAyam which need not be achieved by our individual efforts) in this pAsuram. She first declares that she does not have any anvayam (involvement) in karma yOgam, gyAna yOgam and bhakthi yOgam. One should follow great scholars, here we are going behind cows instead of going behind great scholars. One should go to dhivyadhEsams, here we are going to the forest. If one thinks that even going to forests to perform thapasya can be considered as part of karma yOgam, here we are going to the forest to feed the cows. Even if feeding the cows can be considered as part of their varNa dharmam, we are only feeding the cows which gives milk (kaRavai) and ignoring the other ones. Even eating has many restrictions, and we follow no such restrictions, we eat while walking, we eat with either hands and we eat without even bathing. We have no gyAna yOgam since we are part of "aRivonRum illAtha Aykkulam" (அறிவொன்றும் இல்லாத ஆய்க்குலம்) meaning we have no real intelligence. As bhakthi is gyAna visEsham (an evolved state of gyAnam), since we dont even have gyAnam, there is no question of performing bhakthi yOgam. But we do have one puNyam (good fortune - virtue) - that we are feeding and nourishing bhagavAn who is the ultimate dharmam (krishNam dharmam sanAthanam - kaNNan emperumAn is the eternal religious principle). And this is not achieved by our own efforts - you have yourself voluntarily chosen to come and live amongst us. So, neither we have the external enemies (karma/gyAna/bhakthi yOgams) nor we have the internal enemy (svagatha svIkAram - we ourselves approaching emperumAn and considering our effort as upAyam). Just like we have no intelligence, you also have no defects whatsoever. You are full of auspicious qualities. That too your auspicious qualities are fully manifested when you are in the form of gOvindhan amongst the gOpas. When you are amongst the nithyasUris, only your supremacy is fully manifested but when you are amongst the cow herd boys and girls, your saulabhyam (easy accessibility) is fully manifested. Not only you are full in auspicious qualities and you are the sidhdha sAdhanam (established upAyam which need not be achieved by an individual's effort), you also have the relationship with every jIvAthmA. You are the in-dwelling paramAthmA in every jIvAthmA and without your presence, no entity can sustain themselves. thirumanthram which is revealed by you yourself identifies the nine different relationships between the paramAthmA and jIvAthmA viz pithA-puthra (father-son), rakshaka-rakshya (protector-protected), sEshi-sEsha (master-servant), bharthru-bhAryA (husband-wife), jnEya-jnAtha (known-knower), svAmi-svam (owner-owned), AdhAra-AdhEya (sustainer-sustained), AthmA-sarIra (Super soul-individual soul) and bhOkthA-bhOgya (enjoyer-enjoyed). Thus you have the responsibility to protect us who are surrendered to you. Out of ignorance and love, we have sometimes called you nArAyaNA. You are here establish your simplicity as gOvindhan, but forgetting that we called you nArAyaNA. So please forgive us for that (nAyanAr explains that ANdAL is showing that we should always seek pardon for our mistakes while surrendering to emperumAn ). Because you are the ultimate upAyam and since we have Akinchanyam (nothing in our hands) and ananya gathithvam (no other refuge) and since we have vilakkAmai (not stopping emperumAn from protecting us), please give us the ultimate kainkaryam. Thus, ANdAL establishes emperumAn's nirapEksha upAyathvam (protecting us without any expectation) in this pAsuram. It is still to be understood that Akinchanyam, ananya gathithvam and vilakkAmai are identified here as requirements for emperumAn to protect us - they are not part of upAyam but they are simply adhikAri visEshaNam (qualities of a mumukshu). These qualities differentiate the jIvAthmAs who want to surrender to emperumAn from the jIvAthmAs who dont want to surrender to emperumAn. ANdAL establishes that kainkaryam to emperumAn which exclusively pleases him is the ultimate goal in this pAsuram. We have come early in the morning to surrender unto you. Early morning is compared by nAyanAr to early days of being mumukshu - this state is when we have been cleared of the ignorance but not fully developed attachment towards emperumAn since morning is explained as fully awake and knowledgable state. While you should have come to protect us (because you are the owner and we are the owned), we have ourselves come here. Just like when the dhandakAraNya rishis came to see srI rAman, he became very sad that, he made them come and explain their problems in front of him, instead of himself going to them and enquire about them first. svagatha svIkAram is thus explained as some thing that will bring sadness in emperumAn's heart since that is not natural. Not only we have come, but we have also now offered our praNAmams (obeisances/worship) to you. While dhEvathAntharams (other dhEvathais) expect their worshippers to keep on worshipping them, emperumAn being svArAdhyan (easily worshippable) does not even expect his bhakthas to offer their obeisances towards him - he is most happy to just see them come towards him. Such is emperumAn's greatness - he is just like a father who becomes happy as soon as he sees his sons without expecting anything else from them. We glorified your golden lotus feet which is dear to all vaidhikas. We are not glorifying you and your lotus feet to get anything else - our purpose is to glorify them and that itself is the process and the goal. Now you listen to us, we are going to explain what is paRai (the goal). It is not enough that you have descended to vrindhAvan, you now have to fulfill our desires. You have now voluntarily and willingly born in this clan of cow herd boys and girls. You have to engage us in confidential and appropriate kainkaryam to you. This is ordained for you - because you have now reformed us and developed utmost attachment towards you in us, you have to engage us in kainkaryam as well. When emperumAn says "I will just give you the result of the vratham (nOnbu)", they explain further that the vratham is just a reason to engage with him fully and we have not come to accept any other result than kainkaryam. She says wherever he is in - paramapadham or samsAram, she wants to be with emperumAn. Just like iLaiya perumAL (lakshmaNan) went to forest with perumAL (srI rAman) and never separated from him at any cost, ANdAL also says that she always want to be with kaNNan emperumAn. She says that because he is the owner and she is the owned and the relationship is eternal, she always wants that sambandham (relationship) to visibly manifest. She finally establishes the ultimate goal that she wants to only serve emperumAn and only for his pleasure. She says she wants to serve like lakshmaNan who served him always instead of bharathAzhwAn who lived apart from him for some time. By saying "maRRai Nam kAmanGgaL mARRu" (மற்றை நம் காமங்கள் மாற்று) meaning remove all other desires from us, she declares that neither she want to have any pleasure on her own nor she wants emperumAn to think that she has any pleasure on her own. This same concept is explained by nAmmAzhwAr in thiruvAimozhi emmA vIdu (2.9) padhigam, "thanakkEyAga enaikkoLLumIdhE" (தனக்கேயாக எனைக்கொள்ளுமீதே) meaning emperumAn should engage him in his service exclusively for emperumAn's pleasure. 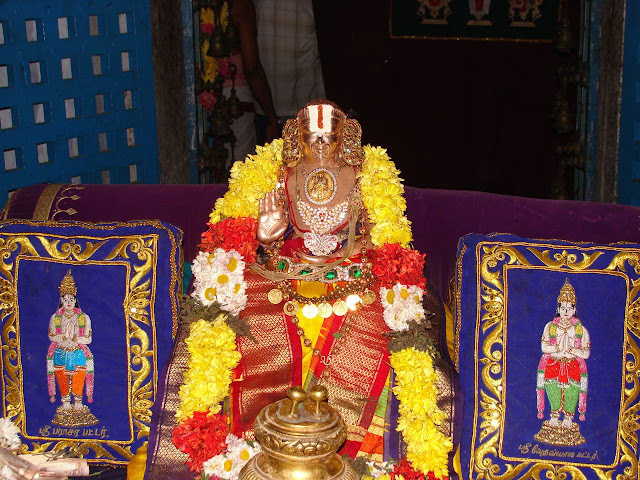 Thus ANdAL establishes the ultimate goal in this pAsuram. Also, "maRRai Nam kAmanGgaL mARRu" (மற்றை நம் காமங்கள் மாற்று) is explaining virOdhi svarUpam - which is engaging in kainkaryam for our own pleasure instead of emperumAn's pleasure. Thus, we can understand the artha panchakam through the divine words of ANdAL nAchiyAr's thiruppAvai and the classic explanations given by many AchAryas who have done excellent vyAkyAnams for this dhivya prabhandham.